When it comes to the rights and regulations of those with handicaps or disabilities, there is a lot of misinformation out there. Whether it is spread from anonymous online chat rooms or water cooler gossip, many people do not know the actual rules about the criteria for meeting handicap or disabled parking permit requirements. For instance, you don’t have to have to be paralyzed in a wheel chair or in a wheel chair at all to use a parking spot with a designated handicap parking sign. 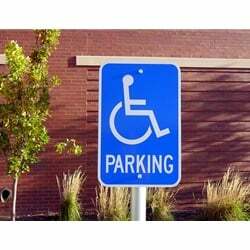 Though the commonly recognized handicap parking signs show a figure of a person using a wheelchair, this is does not mean such a person must use a wheelchair to obtain a disabled parking permit. This moniker for handicapped parking signs was selected because it has become universally recognized as being for people with disabilities. Outside needing to use a wheelchair, there are a number of reasons an individual might qualify for parking where there is a disabled parking sign, including having a lung, heart or circulatory disease. Loss of limbs (or use of limbs) may also qualify one for a disabled parking permit. Each state has its own specific rulings so be sure to check the specifics for where you live. Individuals may also apply for temporary disabled parking placards if they can’t walk a certain number of feet without an assistive device. Those who require the use of oxygen tanks to walk may also be granted temporary disabled placard. A physician, physician assistant, registered nurse or chiropractor must sign off on the permit enabling these individuals to obtain a temporary placard that allows them to legally park where there is a disabled parking sign. To apply for an official handicap parking permit, you must contact your local or state DMV office. Though they are similar across the nation, each state has its own criteria for qualifying for a handicap parking permit and its own paperwork and forms to be completed.